Looking for something to do this fall? This is the perfect time to take an excursion to Everglades City. It is a short drive from downtown Naples, in 45 minutes (36 miles) you can be in one of the most unique, untouched parts of the state. 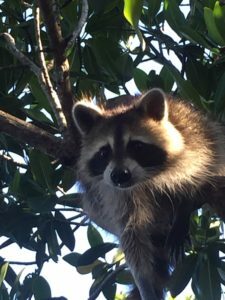 In November and December, thanks to the rainy season, the water levels are high and the wildlife is abundant. Although I still have yet to see my first manatee, they are here along with the alligators, dolphins, raccoons and a remarkable display of water birds. If you make the trip, plan on kayaking or taking an airboat tour through the canopy of mangroves. A kayak cruise on these waterways is peaceful as you quietly wind through the enchanting mangrove tunnels. An airboat trip is exciting as the boats blast though the mangroves and slide through tight turns. We used Captain Jack’s for our airboat tours. 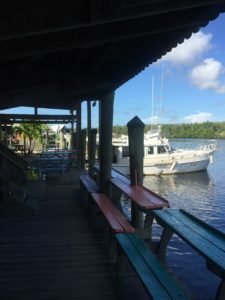 Our captain was both an informed guide to the area and an entertaining comedian eager to share the beauty of the everglades. If you have worked up an appetite, don’t leave before you enjoy lunch at one of the casual waterway restaurants. If you are visiting during stone crab season, which opened on Oct 15, you are in luck as this can be a hotspot for stone crab fishing. 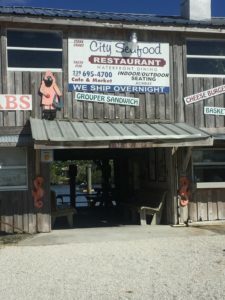 I loved eating at the City Seafood Restaurant sitting on an open air picnic table while enjoying the beautiful scene of the waterway. The view from the back porch is the perfect place to spot a Heron, an Egret, Ibis, Wood Storks, Anhingas and Double-Crested Cormorants. All-in-all, it is an out of the ordinary trip that gets you away from the traffic and pavement for half of a day or longer if you desire. Like this story? Join the thousands of others who read our free monthly newsletter.